One Step Too Far opening line: The heat is like another person to push past as I make my way along the platform. Emily’s journey does not begin on this platform, it starts way back, but it is in the present that we enter her life. This book segues seamlessly between the past and the present and the twist in the tale is something I did not predict and doubt anyone could guess. Running away might be the answer at the time, but it is the running back to what happened in her past that helps heal Emily. ‘ An apparently happy marriage. A beautiful son. A lovely home. Yet one morning Emily Coleman wakes up and walks right out of her life. What makes her do it? How will she survive? And, no matter how hard she tries, can she ever really say goodbye to her past? Emily has a secret. No-one has ever guessed it. Will you? 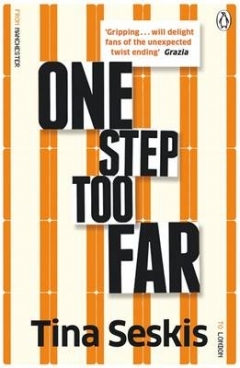 I recommend that you rush out and buy One Step Too Far as soon as possible. This has to be one of the best written books I have read for some time and renews my joy for reading. Tina Seskis will be an author I look out for in future. Edit: Tina Seskis sent me an email having read this review to say thank you. It is small things like this that make blogging so worthwhile. Sounds good! I love books about life’s inspiring stories and this could be one of them…Thanks for the tip, Tandy!! I will look out for this Tandy – always looking for a good read. Hi Tandy, this does sound like a great book, will put it on my list of things to read!